The Great Taste Awards is the one of the most trusted and recognised food and drink awards. Each food entered receives feedback from the panel of over 300 judges. Mirroring the Michelin system, in the sense that 1 star is good, 2 is outstanding and 3 being exceptional. Started in 1994, The Great Taste Awards are the biggest independent benchmarking scheme for local, regional and speciality foods in Britain. Judging is carried out by over 350 professional foodies that are brought together each year to take part in 45 days of judging, deciding which foods deserve one-star, two-star or the ultimate three-star awards. 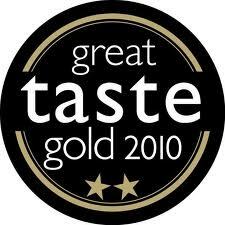 Look out for producst that carry the coveted black & gold-star GREAT TASTE stickers, which winning products proudly carry. For 2011, over 7400 products were judged over an intense two-month period. The Awards’ organiser, the Guild of Fine Food constantly refines the judging mechanics and this year was no exception. Before gold is awarded, a minimum of twelve experts, often 16 taste, discuss and agree. For two- or three-stars, up to 20 judges must unanimously agree an entry has achieved absolute perfection. The Cheese and Wine Shop stocks many products that have won awards at The Great Taste competition.